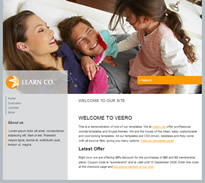 Joomla Themes - LearnCo from Veero and discount coupon! LearnCo from Veero and discount coupon! Veero have released a new theme and have opened up a special offer that runs until September 20th and I'm about to go out for a beer. What a great day. The theme is called Learn Co and you can see a demo of it it here. The special offer is a 20% discount for two of the plans they offer; M2 and D2. All you've got to do is input the coupon code "summerend" when checking out for either of those packages. Click here for information or to see more of the themes from Veero.